dance while infusing a positive and fun atmosphere for students to start or continue their dance education. We strive to make possible a young dancer’s dream to pursue a career in dance performance, or as a dance educator. At Cornerstone Dance we make sure that all dances, music and costumes are family appropriate. 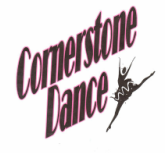 Cornerstone Dance opened in January 2003 in Gustine, CA. invited to join the variety of classes for all skill levels, beginner to advanced. Please contact our office for more information.